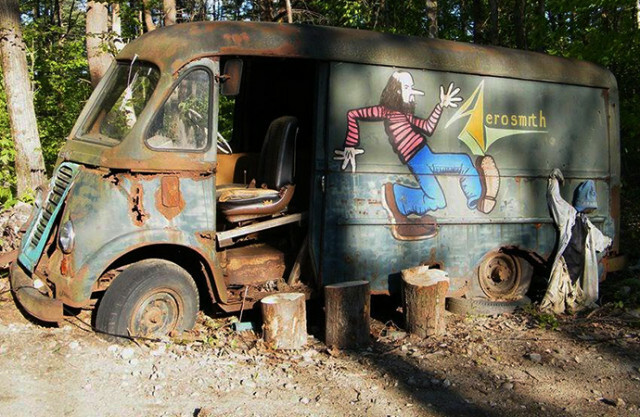 A 1964 International Harvester Metro found in Massachusetts by a reality television show is none other than the first touring van used by the legendary rock band Aerosmith. The Boston Globe reported the van was discovered on private property in Chesterfield, across the state from where the band was founded in Boston. The find was documented on the History Channel show “American Pickers.” Footage showed the rusted van with “Aerosmith” written on the side being loaded onto a trailer. The man who owned the land, identified in the episode only as Phil, told host Mike Wolfe and Frank Fritz that the van was there when he bought the property from another person who had some sort of connection with the band. Wolfe was put in contact with Ray Tabano, a founding member of the band who was replaced but later returned to work for the group. Tabano confirmed the van was used by Aerosmith as it made its way to gigs in New England. “I’m afraid to say how long it is, but it’s been like 40 years since we’ve been in this thing,” Tabano said in the episode. Wolfe and Fritz bought the van from Phil for $25,000. The show did not give details on what the pair planned to do with it, though one can only hope it’s brought back to life without ruining its former rock glory — and excellent patina. This article, written by Carter Nacke, was originally published on ClassicCars.com, an editorial partner of Motor Authority.